If you or a loved one is in the hospital, you might find yourself paying closer attention to it, wondering what the numbers and beeps mean. Though there are many different makes and models of vital sign monitors, most generally work the same way. Small sensors attached to your body carry information to the monitor. Some sensors are patches that stick to your skin, while others may be clipped on one of your fingers. The devices have changed a lot since the first electronic heart monitor was invented in 1949. Many today have touch-screen technology and get information wirelessly. 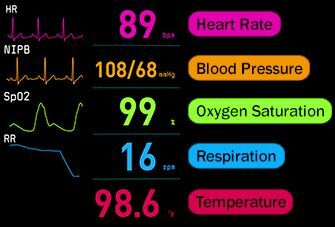 The most basic monitors show your heart rate, blood pressure, and body temperature. More advanced models also show how much oxygen your blood is carrying or how fast you’re breathing. Some can even show how much pressure is on your brain or how much carbon dioxide you’re breathing out. The monitor will make certain sounds if any of your vital signs fall below safe levels. Heart rate: The hearts of healthy adults typically beat 60 to 100 times a minute. People who are more active can have slower heart rates. Blood pressure: This is a measure of the force on your arteries when your heart is beating (known as systolic pressure) and when it’s at rest (diastolic pressure). The first number (systolic) should be between 100 and 130, and the second number (diastolic) should be between 60 and 80. Temperature: Normal body temperature is usually thought to be 98.6 F, but it actually can be anywhere from just under 98 degrees F to a little over 99 without concern. Respiration: A resting adult typically breathes 12 to 16 times a minute. Oxygen saturation: This number measures how much oxygen is in your blood, on a scale up to 100. The number is normally 95 or higher, and anything below 90 means your body may not be getting enough oxygen. If one of your vital signs rises or falls outside healthy levels, the monitor will sound a warning. This usually involves a beeping noise and a flashing color. Many will highlight the problem reading in some way. If one or more vital signs spikes or drops sharply, the alarm may get louder, faster, or change in pitch. This is designed to let a caregiver know to check on you, so the alarm may also show up on a monitor in another room. Nurses are often the first to respond, but alarms that warn of a life-threatening problem can bring several people rushing to help. But one of the most common reasons an alarm goes off is because a sensor isn’t getting any information. This might happen if one comes loose when you move or isn’t working the way it should. If an alarm goes off and no one comes to check on it, use the call system to contact a nurse.